The highest honor from my peers! I am in such awe for how my path is catapulting forward as a spiritual practitioner and yoga teacher. I went into the Teacher Training program at Asheville Community Yoga, in January 2016, looking to deepen my own practice, with no intention of teaching. My world was blown so wide open and I remember the “click” exactly, when my mind switched from “oh hell no”, to “oh my God, I was meant to do this!” Let’s be honest, I just really like to tell people what to do, and they do it willingly:) ok, sort of a joke, but it is really amazing to watch a sea of bodies flowing and moving together, but in their own rhythm and motion. I feel like teaching is sort of orchestrating this amazing dance, where no two people look the same. It is quite magical and beautiful, and all I do is crave more. I LOVE teaching. Nothing else I have experienced fills my soul with such pure joy and the feeling that I am “helping” someone in some way. 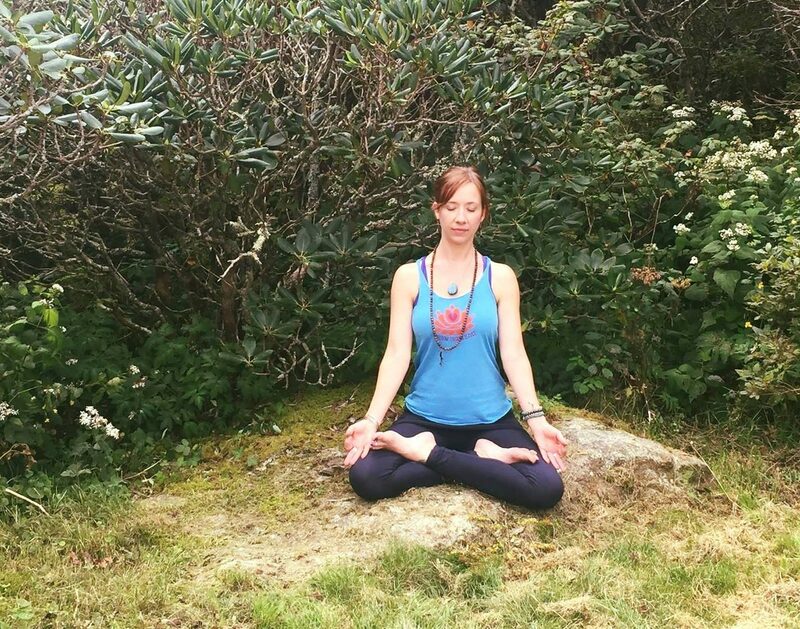 This month, less than one year that I have been a teacher, I was acknowledged by my peers, teachers, and the guides who brought me to my teaching path, as the June Teacher of the Month, at Asheville Community Yoga. I couldn’t be more proud to be part of such an amazing community! Click below to read my Q&A and learn a bit more about me and my Yoga Path! 30 day countdown to 40! Welcome to my very first blog post! Whew, I have thought about this day for a long time. I talk a lot, so it’s only natural to want to write and “talk” with even more bright and shiny lights out in the world. I have so much I want to share with all of you, and it will all happen in time. Today is kind of a milestone for me in a way. This day begins the 30 day countdown until I enter a new decade, and turn 40. That even just looks and sounds weird! How in the hell am I about to turn 40?! I don’t feel 40. I don’t think I “act” 40 (whatever that means!) And I don’t think I look 40. But, what does 40 look like anyway? Well, that depends on a lot of things, but mainly genetics and lifestyle. I got quite screwed in the genetics department, so therefore I am fighting like hell to battle the obesity, diabetes, cancer, heart disease etc that is in my DNA, with my lifestyle. My diet is basically Paleo, even though I can’t stand labels! Basically, if I can’t pronounce it or know what it is, I don’t eat it. I eat whole and organic foods, and avoid processed foods. I eat local and grass fed humanely raised meat, but limited. I have tried a vegetarian diet, and was vegetarian for 7 years. It just doesn’t agree with me totally, with some of my dietary and gut issues I have suffered from since I was a child. That all being said, today I start a 30 day elimination diet, or as a lot of folks know it as the “Whole 30.” Again, I can’t stand a label! Basically, my trip to the east this winter was difficult to stick to my eating plan as a lot of the places I went, focus on rice and naan as staples. Dairy was added to stews and curries, and a lot of my trip I wasn’t given the option for “gluten and dairy free” foods. I was an opportunistic eater and ate what was provided. How do you act “picky” or point out allergies in countries where people are starving? Well, I don’t know either and I didn’t do it. I ate and was happy about it. Until my digestion and skin argued loudly enough I had to visit with an Ayurvedic doctor in India. However, even after he provided herbs to help remedy my discomfort at the time, my diet and practice have not been back on track fully, slipping here and there, for many months now as I have been adjusting back to my life here in Asheville, NC. I moved in with my partner, Kevin, when I returned and needless to say…our diets are nowhere near or similar to each other. The more we are together, the more I want to be around him. So, in turn, my practice has slipped a little as well. Add in some unexpected travels to lose a family member to cancer, and all hell breaks loose with you diet and yoga and meditation practice. So today, 30 days until the 4th revolution around the sun begins for me, I start a reset. Not only will my diet change and go back to the basics: organic meat, organic vegetables and some fruits, and nuts and eggs. That’s it. 30 days: no sugar, no processed foods, no dairy, no grains. For me, not too bad as this is my regular diet I have followed for years. But, I need a reset for sure to get back on track. I am also starting 40 days of Yoga and Mediation. Every. Damn. Day. YES!! Some days I get “tired” or find any excuse to not practice. It has become easy to slip. I am sure a lot of you know exactly what I mean! Well, I like goals and plans. I like structure and discipline. And I need the push and motivation to start 40 off on the best foot possible! We’ll see how it goes. I’ll be here writing about my experiences. I hope you will be too! Have a most beautiful and positive day, doing what you love! Or, at least, love what you’re doing today!